Scroll down to see our first mattress ever made. The founder of Dog O Pedic , Is Zane Maroun the previous owner of Sleep Active. Sleep Active was the first company in South Africa to make and sell Memory foam Mattress’s and pillows, Made in South Africa. While Zane Maroun was the owner of Sleep Active he experienced Customers are benefiting greatly from Memory Foam pillows and mattress’s, customers that suffered from arthritis, muscle injury, surgical repairs and even customers that were bed ridden and in their Golden Years. Memory foam made our customers heal faster whilst at comfort and enjoying a pressure free sleep. Zane Maroun Sold sleep Active 3 years ago and retired, during his retirement he was thinking of the next product which he could invent that could change people’s lives but he was also looking for something he was passionate about. Then One day it hit him straight in the face, His favourite fury friend in the world, Scrappy Coco Maroun, his dog a cocker spaniel…. Zane Maroun Noticed the horrible round cheap unwashable bed, which he provided his fury friend to Sleep On, In that moment Zane Maroun felt ashamed. Zane Maroun started to do some investigating into the dog bed world and noticed the Dog bed trend in Europe and America would mainly use the same memory foam and shape as they would use in the Human bedding world. 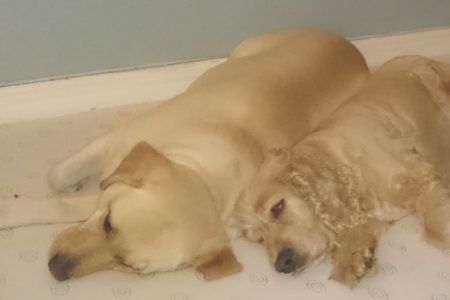 Animal specialists prefer our fury friends to sleep straight out and not curled up, therefor why do we give them cheap round beds which are unhygienic and use cheap B Grade foam? When our fury friends sleep at least 12 hours a day, which means they sleep 50% of their life. That’s why at Dog O Pedic we believe they deserve the best! Our fury friends that suffer from hip dysplasia, arthritis, general aches and pains, surgical repairs and the Golden Years will have a better life with a Dog O Pedic underneath them. They will benefit greatly from memory foam as it is pressure relieving, giving support and keeping their spines aligned. Our memory foam is SABS Approved and not B grade foam. 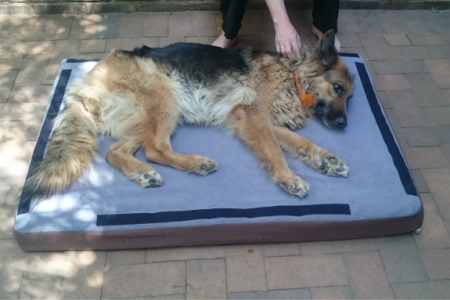 Dog O Pedic makes rectangle mattress’s for our fury friends so they can sleep straight and stretched out. So a product of Love is born, Zane Maroun can now Sleep Peacefully knowing that his fury friend can sleep in ultimate comfort. On his new Dog O Pedic memory foam mattress.